The Memsie Stakes is the opening Group 1 race of the annual Melbourne Spring Racing Carnival and takes place at Caulfield Racecourse in late August or early September. The headline race at the meeting, the weight-for-age clash is run over 1400m and gives the season’s top milers and stayers an early chance at elite level glory. Worth a lucrative $1 million in prize money, the Memsie Stakes is often contested by horses heading towards the season’s majors including the Caulfield Cup, Cox Plate and Melbourne Cup. Elevated to a Group 1 race in 2013 it has been won by many notable horses including Atlantic Jewel (2013), So You Think (2010), Weekend Hussler (2008), Miss Finland (2007), Makybe Diva (2005), dual champ Sunline (2000 & 2001) and Dane Ripper (1998). The latest edition of the Memsie Stakes is set to take place on Saturday September 1, 2018. The race market and odds will be released here the day the final field is published by Racing Australia. Memsie Stakes betting is always popular as the markets usually feature some smart types returning from their winter spells. Favourites have a gun record in the race so looking for the horses at the top of the Memsie Stakes odds is always a good bet. From 2007 – 2016 six favourites in Memsie Stakes betting saluted for the punters, most recently Black Heart Bart (2016). 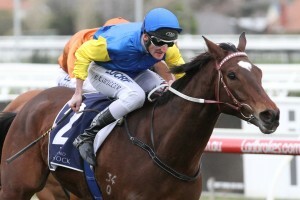 Betting really heats up once the field is out and horses drawn well usually dominate the markets as just one Memsie Stakes winner has jumped from a double digit barrier since 2004 with King’s Rose (11 in 2011). The Memsie Stakes field has a capacity of 16 starters, but hasn’t run with its maximum number of contenders since 2000 when Sunline won the first of her two editions of the spring lead-up. The race field has attracted 11 or more starters every year since 2003 apart from in 2005 when Makybe Diva beat home only six rivals. Black Heart Bart (2016) was the last favourite in Memsie Stakes betting to salute for the punters. Photo Credit: Ultimate Racing Photos. Horses traditionally run in the Memsie Stakes field first-up and in 2015-16 the winner had their last start in Brisbane’s Group 1 Stradbroke Handicap the previous June with Boban (2015) and Black Heart Bart (2016) both improving on seconds in that winter feature. The best out of the Memsie Stakes field traditionally back-up a fortnight later at Flemington in the Group 1 Makybe Diva Stakes (1600m), the double last completed by Dissident (2014). The Memsie Stakes final acceptances are released on the Wednesday before the race runs on a Saturday and the nominations close that Monday. The official Memsie Stakes 2018 Final Field & Barrier Draw can be found below..
Memsie Stakes tips historically have the favourite predicted as the one to beat as history shows the shorter priced horses have an outstanding recent record in the weight-for-age race. Classy miler – stayer types are also popular in the tipping as all seven winners from 2010 – 2016 had their lead-up run into the race in Group 1 company, including two that came out of an autumn run in the Doncaster Mile with Dissident (12th in 2014) and Sincero (4th in 2012). Our Ladbrokes’ insider Memsie Stakes 2018 betting tips and early spring Group 1 race selections will be detailed below the week of the race so bookmark this page for the horses to back and sack in the Caulfield classic. The form guide has all the details you need to know before placing your bets on the season’s opening Group 1 clash. Along with the saddlecloth numbers, trainers, jockeys and barriers the form guide shows the recent lead-up runs of all the runners and their starting price in the markets. Looking for horses that have previous Group 1 experience, run well fresh and are drawn well are all important things the form guide will show you. The results and finishing order are published when the WFA feature runs as Caulfield Race 8 on the first major meeting of the spring in Melbourne. The results show the winner, successful quinella and trifecta as well as the margin and time run to see if any records are broken. The official Memsie Stakes 2018 results & finishing order will be published in full right here once the Group 1 race is run and won on Saturday September 1, 2018.